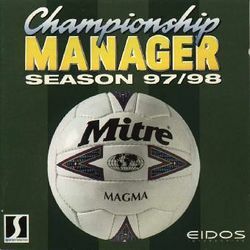 Championship Manager 97/98 is a game in the Championship Manager series of soccer management computer games, based on the Championship Manager 2 game engine. It was developed by Sports Interactive and released in October 1997, exclusively for the PC, as the final game in the second generation of CM games. Championship Manager 97/98 was the top selling PC game of 1997, despite Sports Interactive encouraging game-sharing by not including any CD-protection. The game could be installed on any number of PCs without needing a copy of the CD to play it, which indicates that it was most likely even more popular than it seemed. SI have since said that this move was to gain as much exposure from the CM2 series as possible before the release of the CM3 series. The gameplay in CM97/98 remains very similar to other games based on CM2, but as usual this installment offers far more than a simple database update. It is a clear indication of Sports Interactive's intent for the future of the franchise in two ways: the inclusion of a database editor with the game showed that SI were actively encouraging users to modify and customize the game; and the inclusion of nine playable leagues from across Europe was a clear sign of things to come, in terms of the growing depth and global scope of the game. Aside from added playable leagues, bug fixes and updated player data, there are also other new features in the game. Club squads can now contain 32 players (2 more than the previous version), Champions League and UEFA Cup formats were changed to reflect their real-life counterparts, added control over tactics (including selection of set-piece takers) and international under-21 matches were now simulated fully. This page was last edited on 16 August 2016, at 14:39.